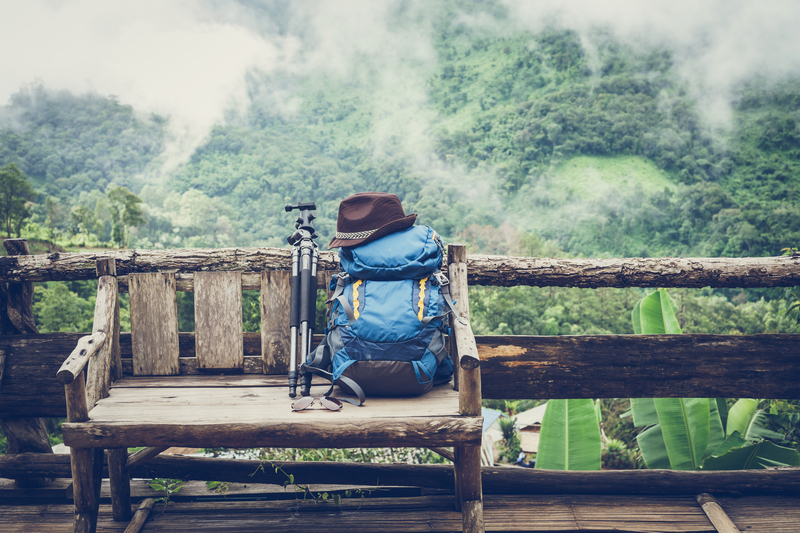 If you’re heading on a long backpacking trip or even an adventure trip, you need to ditch the cumbersome suitcase or carry-on back and instead invest in one of the best travel backpacks. Backpackers and hikers venture off to distant destinations where plenty of adventure awaits. 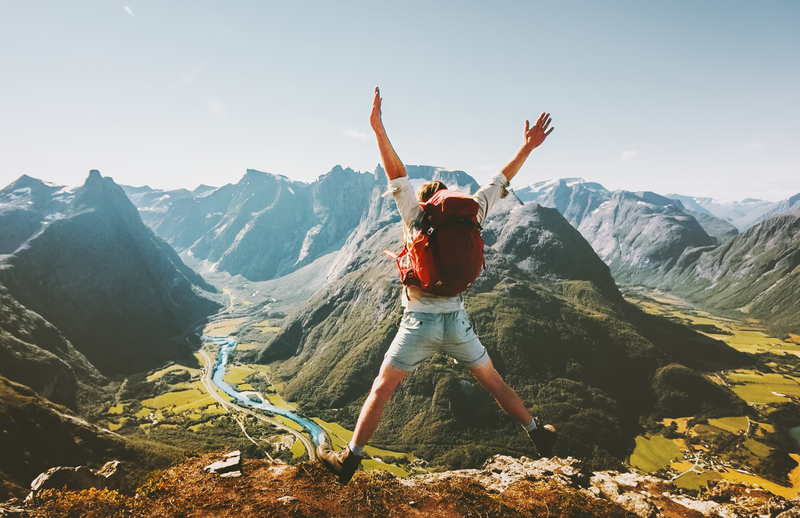 Most backpackers will be walking through steep terrain, cramming on buses, or living out of their backpacks for weeks at a time as an adventurer or digital nomad. Pulling a suitcase isn’t an option. With the nature of backpacking, you’ll need a good bag that will fit you comfortably. Investing in one of the best travel backpacks will make a significant difference during your next adventure trip. 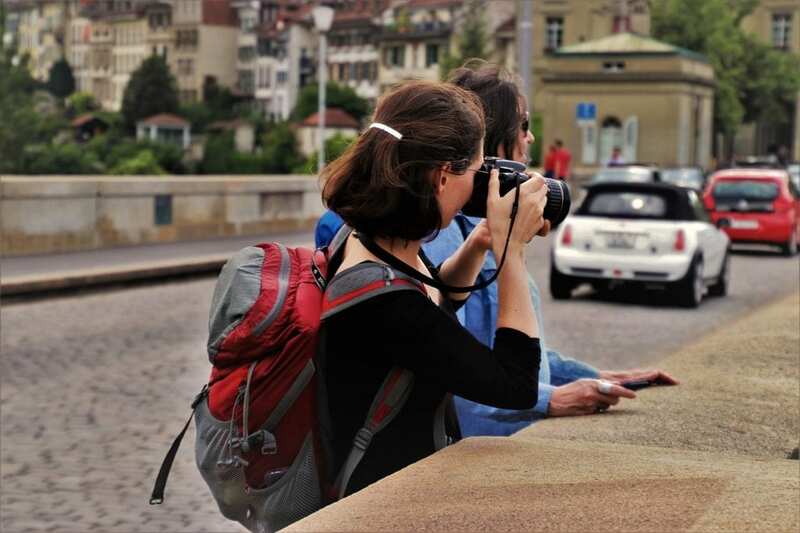 Here are the top 5 best travel backpacks and how to choose the best one for you. 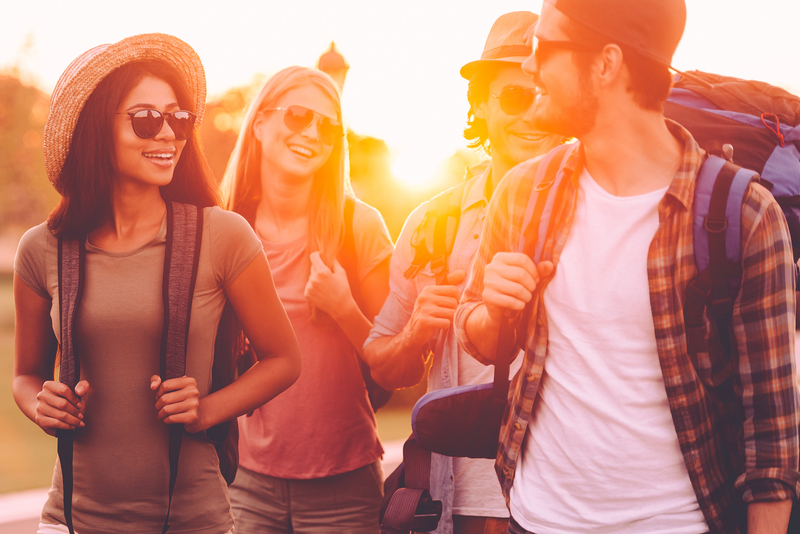 Travel backpacks can be a considerable investment, and it’s easy to shell out hundreds of dollars on one of the best travel backpacks. 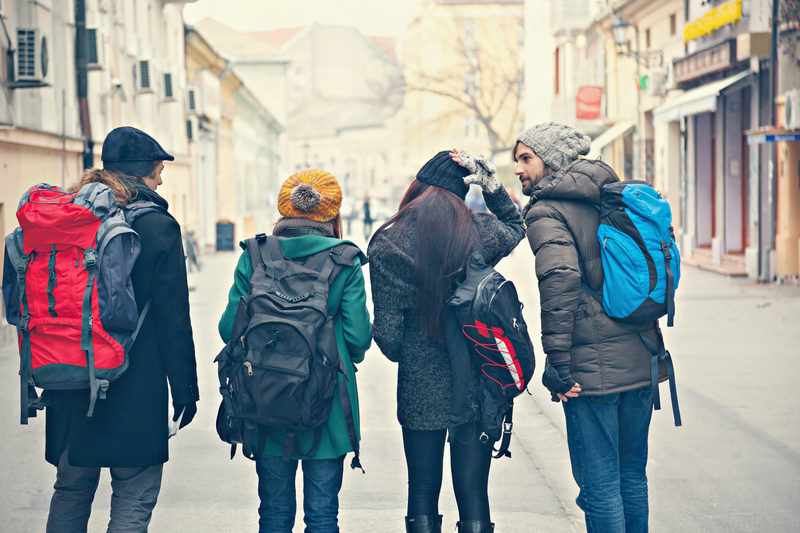 Luckily, there are several budget-friendly options for someone looking for a good quality backpack for their travels. 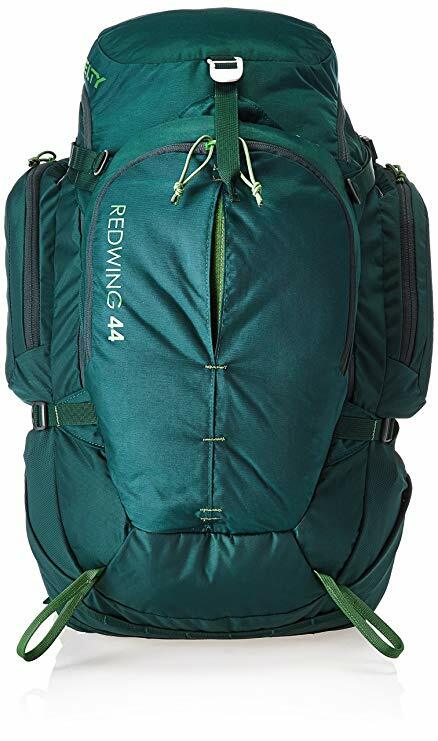 Kelty Redwing has a high-quality travel backpack that has the perfect amount of space for short trips or even longer hauls. The best part about this bag is that it offers all of the great features you would expect from a travel backpack, but you’ll only spend a little more than $100. Hybrid zipper: This U-zipper design can work as a panel loader and a top loader. This feature helps you access your belongings when you need to. Hydration pack compatible: The dual-use laptop and hydration sleeve can adapt to your needs when you’re on the road. Interior organizer: The inside has organizers so you can keep electronics, pens, maps, and other essentials where you need them and use to find. Lightweight backpack: This bag weighs only 2 lbs 10 oz so you can carry what you need without the bag itself weighing you down. Ventilated back panel: This panel helps to help keep sweat off as you’re hiking or wearing your pack. Larger size: If you stuff the bag, it may not pass carry-on size limits. No lockable zippers: Because the zippers don’t lock, the bag isn’t as theft-proof as some other bags out there. 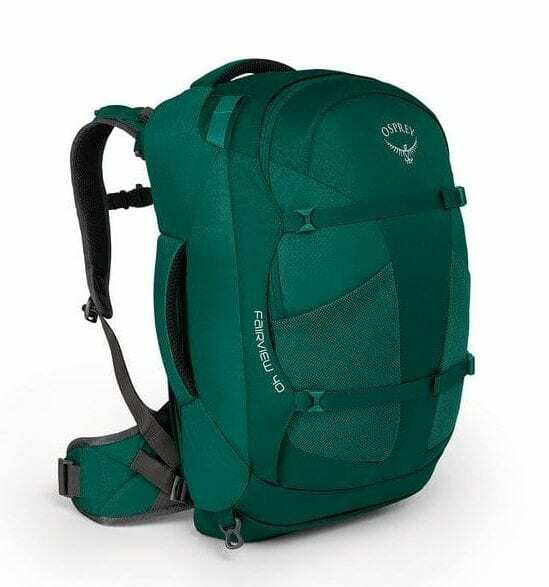 Osprey is one of the top makers of travel backpacks, and they have several types of backpacks made specifically for certain physiques. The Fairview 40 is one of the best travel backpacks for women because of it’s lightweight design, comfort, and versatility. This backpack can double as a messenger bag, a duffel bag, or a sturdy backpack for your next adventure. 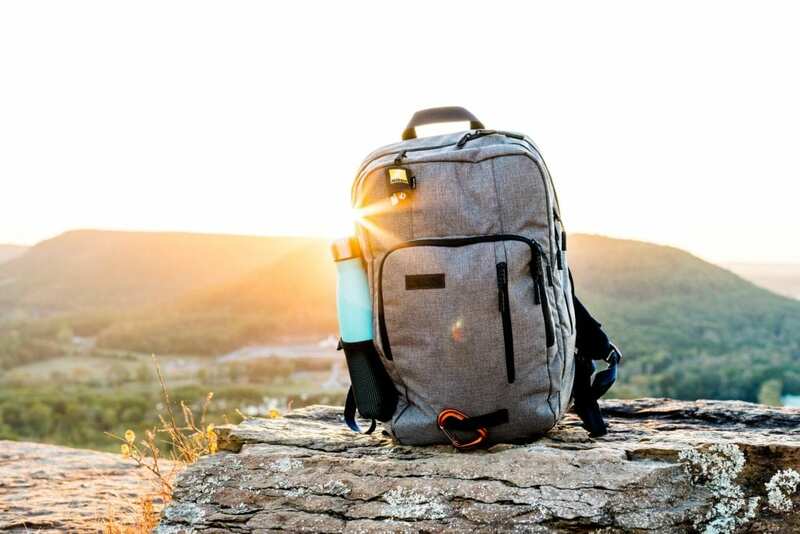 It also has a sleek design that doesn’t fit the typical hiking backpack, making this bag an option for almost any type of trip. Electronics sleeve: You’ll be able to protect your laptop and tablet on the go. Size options: This bag is available in three sizes to fit your needs as a traveler. Suspension system: If you don’t like your bag to look like a typical backpacker’s pack, you’re in luck. The suspension system on this bag doesn’t have the usual hiking look but still gives you plenty of support. Heavier materials: This bag is not the lightest backpack because it weighs about three pounds. The Farpoint 40 works like the Fairview, but it’s built with the male body in mind. It has all of the features that make this bag one of the best travel backpacks for men. Customizable sizes: Not every traveler has the same needs, so many people will appreciate having different sizes to choose from. Mesh panel: The back panel, harness, and hip belt have mesh, which reduces chafing and improves ventilation. Checked luggage only: The bigger options are not carry-on size, so you’ll need to pay to check your bag if you fly. Heavier materials: The smallest bag weighs three pounds. 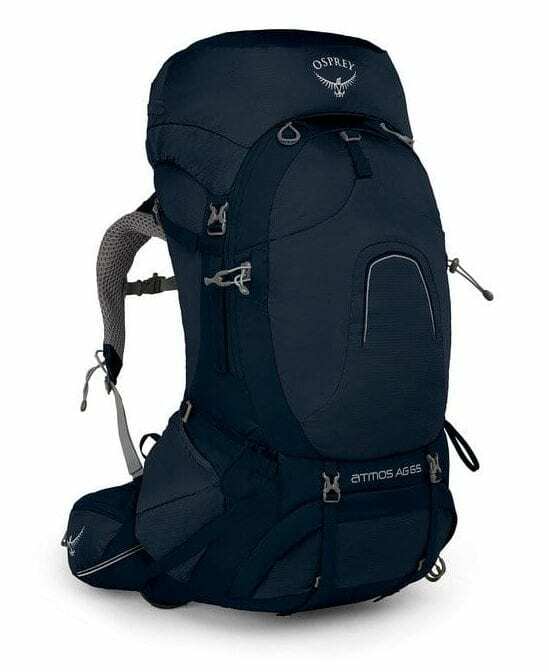 Another winner travel backpack in the sturdy Osprey family is the Atmos AG 65. The Atmos AG 65 is perfect for those long-haul trips. 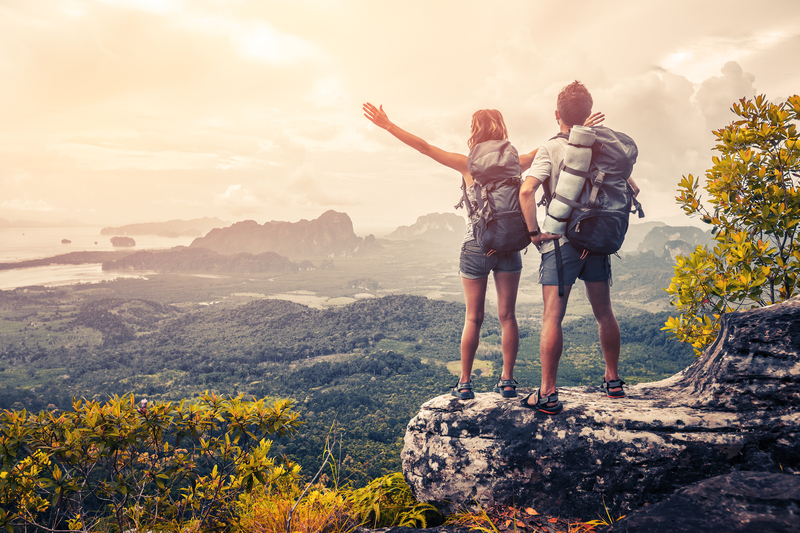 Are you going on a long hiking trip? Or are you heading on a backpacking trip throughout South America? You’ll want a bag that can hold any and everything, has a comfortable suspension system, and is easy to move around. The Atmos AG 65 has the backpacker’s comfort in mind. The adjustable straps and anti-gravity suspension system makes it feel like you’re carrying less weight. Overall, this backpack is the best option for your long haul treks. Anti-gravity suspension: The advanced suspension system makes the bag feel lighter than it is. Hydration pack sleeve: You can add a hydration pack to help you get enough liquids while you’re adventuring. The pocket accommodates up to a 3L reservoir. Trekking pole attachment: This feature lets you stow your poles when you need to have your hands free. Larger size: Some options may not fit as a carry-on. A top contender in antitheft bags, Pacsafe brings you the ultimate pick for a short weekend getaway or hiking trip. The VentureSafe X30 is a versatile option that is perfect for your shorter trips but still packs a punch. The backpack comes with all of the features you need in a good travel backpack while also featuring anti-theft technology to keep you and your things safe. Take this backpack on a short camping trip or even on a trek to a new city. Anti-theft protection: The slash-proof straps protect you from slash thieves, and the pocks have RFID-blocking technology. Security hooks also help keep the bag safe. Hydration/laptop sleeve: This sleeve fits a 15″ computer or a hydration pack. Harder to open: While the build helps deter thieves, the bag isn’t as easy to open because of it. Hip belt: There’s no option to hide the hip belt, and it can be uncomfortable. When you’re looking for one of the best travel backpacks, you have a lot to keep in mind. 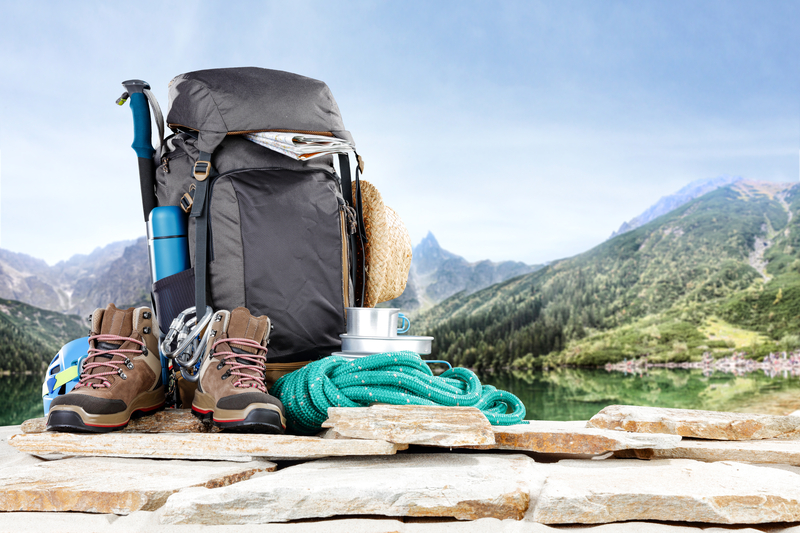 Use this buyer’s guide to help you determine what you need in your pack. Travel backpacks are for long journeys, so they must be comfortable and give good back support. A good travel backpack is designed to be comfortable for hours of walking. The last thing you want is to be stuck with a lopsided uncomfortable bag while walking through hilly cobblestoned streets in search of your hostel. Here are some things to look for to make sure your backpack will be comfortable. Exposed wiring and rods are both ugly and extremely uncomfortable. A bag with an internal frame will have the proper padding so that you can’t feel the frame while carrying the backpack. The back of the bag is more important than you think. A well-padded back will give the support you need to carry your bag for hours at a time. If you’re carrying weeks of clothes in one bag, you’ll need the proper support to keep the weight evenly distributed throughout the backpack. A contoured, padded back will help the weight of the bag distribute evenly and will give the bag a more natural arch. 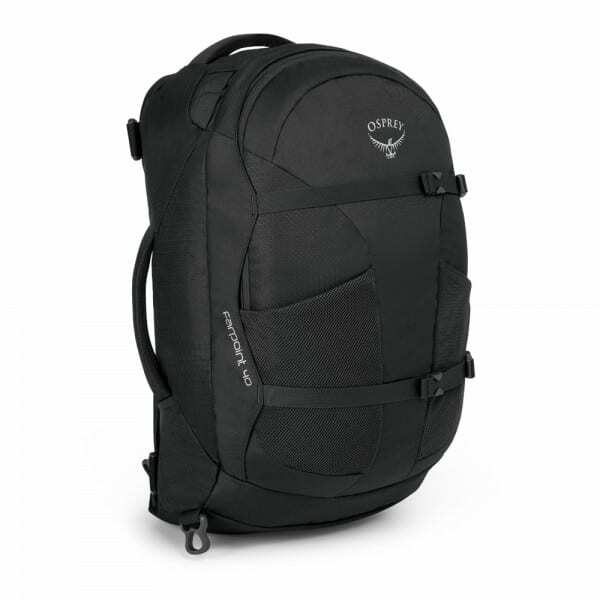 The contoured back will also allow airflow so that you and your backpack don’t get sweaty. The best travel backpacks are the ones that offer so much support that you forget you’re even wearing it. A good travel backpack should have several extra compartments besides the main ones on both the inside and outside portion. Compartments help organize your packing and keep your things in order. Instead of digging around for smaller items, utilizing the various compartments in the backpack will save you time and stress. Items like shoes, your toiletry bag, and other miscellaneous travel items are some examples of things to place in your compartments instead of the main compartment. You’ll need the outside compartments for easy access to things while on the road. For example, many belt straps contain small pockets that are easy to access. These compartments are helpful for quick access things like money, headphones, or even lip balm. Pockets on the outside are also ideal for maps and travel umbrellas you’ll need to grab quickly. Detachable daypack: Some bags have detachable daypacks that you can put enough in for a short trip or while you sightsee. Laptop sleeve: This compartment is essential if you are traveling with a laptop or a tablet. A lot of travel backpacks have laptop sleeves so that your computer is secured. You don’t want your computer floating around in your bag, especially while flying, so a fitted pocket helps protect your belongings. Water bottle pocket: Many travel backpacks have mesh side water bottle holders. Leaving water bottles inside of your pack could be a spill hazard. Mesh compartments are great because whatever you put inside is easy to reach whenever you need it. If your bag doesn’t have the compartments you want, you can use packing cubes to help keep things organized. You’d be hard-pressed to find a backpack that is 100% waterproof. However, that doesn’t mean you can’t find one with good waterproof material. Make sure that whatever brand of backpack you choose has good durable material that won’t soak through with a little water. This material comes in handy on rainy days or if you ever spill something while traveling. In any case, check if the backpack comes with a waterproof tarp that you can pull over the bag in case of heavy rain. Look for nylon or polyester that is thick and will last a long time. 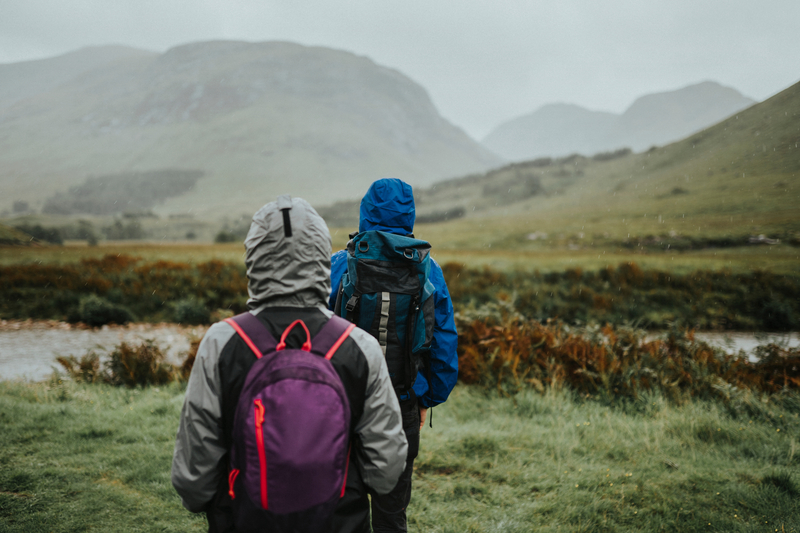 If the backpack doesn’t come with a rain cover, you can usually find options in sport equipment stores and online. The travel backpacks of today are usually internal frame backpacks, meaning that the wiring and frame that holds it together is inside. Most backpacks you see will have an internal frame. Outer frames are mostly in the past because almost all of them are uncomfortable and bulky. Packs made today have a sturdy and durable inner structure that makes a lightweight backpack. If you’re traveling light to save on the weight you need to carry, check to see how much extra weight the frame will add to your load. The shoulder and belt straps are also a crucial part of the comfortability of a travel backpack. The way that the bag distributes the weight depends on the quality of the shoulder straps and hip belt straps. Because of the longterm wear of travel backpacks, you’ll usually find most of them with a well-padded shoulder and hip belt straps. You’ll want a bag with thick padding on these straps so that your body is supported and comfortable while carrying the backpack. Some travel backpacks have anti-theft technology built into the straps like the Pacsafe VentureSafe backpack. The straps have wiring built into it so that thieves can’t cut into your bag while you’re out sightseeing. You may think that the size of your backpack is related to how much you want to pack inside of it, but that’s not wholly accurate. While bigger backpacks may carry more, the size of the bag depends on your body type. If you get a pack that is too wide or too tall for your body, it will be uncomfortable and could cause back pain. A good travel backpack is one that distributes the weight evenly and can carry a sufficient amount of your clothes. Picking the biggest bag isn’t always the best way to go. As far as the capacity of the bag, inspect the inside of the bag to see how much it can hold. Some backpacks may look like they fit more than they can. The last component of travel backpack size is carry-on vs. a non-carry on bags. The bigger your backpack is, the more likely you will have to check it. With airline regulations cracking down on the carry-on size and weight, this could make a difference in the price of your plane ticket and travel time. These fees can add up even more with frequent travel. 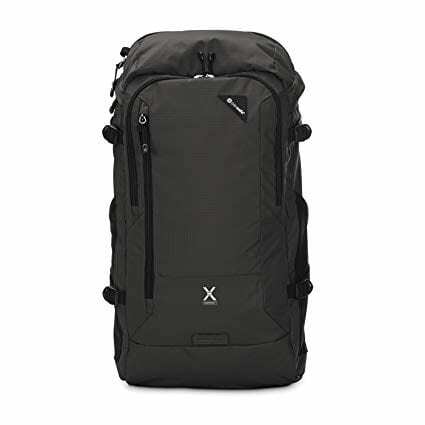 In our roundup of the best travel backpacks, we included several options that meet the airline regulations (22 x 14 x 9in). One of the most significant decisions when choosing a travel backpack is picking a front loader vs. top loader. A front loader backpack is one that opens up like a standard suitcase. When you lay down the pack, instead of opening it the traditional way at the top, a zipper opens down the front of the bag. Opening a backpack from the front gives you better options for packing. Instead of essentially stacking your clothes into the bag, you can load it by laying it down. This difference provides better organization and more convenient access when unpacking or grabbing for something. Front loaders also offer more security because you can secure a lock on the zippers if you want to. Many travel backpacks are front loaders and can be worn in various ways. Top loaders are the more traditional style of opening a backpack. These usually have a drawstring and a flap that folds over it. Most people consider this to be not as safe because a drawstring is easy to open. Some people claim that top loaders are much easier to carry around because of how slim and lightweight they tend to be. A top loader is also said to provide better back support for walking. If you’re a smaller person, a top loader may be a better choice for you because of the distribution of weight. The best way to decide which one works better for you is to go to a nearby store and try on different travel backpacks. Every opening in a backpack should have two zippers so that they easily be locked together. The bag may or may not come with a lockable zipper, but you can use a lock if the bag has two zippers to secure your belongings while in transit or if you have to leave it in a public place like a hostel. Our picks for best travel backpacks for short trips has lockable zippers as well more special anti-theft features to keep unwanted hands away from your belongings. 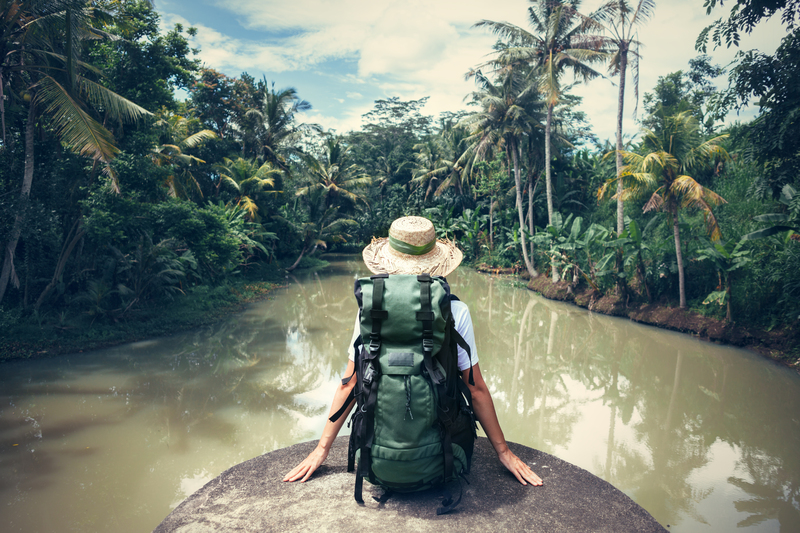 Whether you’re going to South America, Southeast Asia, or Europe, a travel backpack can help you pack light and still have everything you need while you’re on adventures. Choosing the best travel bag can make a huge difference is how you feel. Next time you shop for one of the best travel backpacks, take this list into account to help you make the best choice.